Do you find yourself checking your fridge over and over hoping something amazing has spontaneously appeared? Do large clods of dirt make you do a double-take that only leads to disappointment? You, my friends, are suffering from that most tragic of foodie ailments: trufflitis. 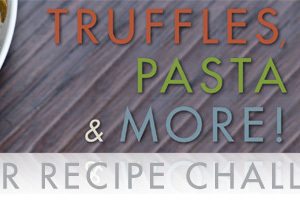 * Fortunately, we at MarxFoods developed a cure: a Truffle & Pasta Recipe Challenge! To create tasty new truffle pasta recipes for your truffle emergency needs. Visit the Pasta & Truffles Recipes Collection to see what they came up with! * n. a condition characterized by an all-consuming, insatiable desire for fresh truffles. Pingback: Truffles, Pasta & More Recipe Contest : : Cook. Vegan. Lover.